There are full of joy in being alive! 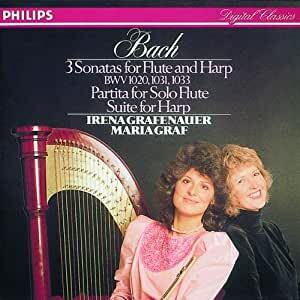 Bach: 3 Sonatas for Flute & Harp, BWV 1020, 1031, 1033 / Suite for Harp is a recording played by Irena Grafenauer (flute), Maria Graf (harp) and David Geringas (Violoncello) on this Philips Classics Productions recording from 1987. Lionel Salter has written a short yet informative essay entitled "...For every kind of instrument". Recommended. 4/5.